Enhance: one button finds words to hashtag in your post or up to two to add to the end. Don’t have the time to do the main few things that you know you should be doing to optimize your Tweets, Facebook updates, Google+ posts and Pinterest scheduled pins? Click the Enhance button to get a consolidated set of suggestions: an image to add, emoji, 1-2 relevant but also real time engagement-proven hashtags to add either to the text of your post (within your post/update Tweet text) or at the end. You can also set up your default Enhance Preset to shorten URLs with your default Rite.ly Link Ad. Either click the browser button to Enhance a post starting with page title and URL or highlight text, right-click and choose from your saved Enhance Presets. You can modify any element of Enhance with the pull-down to the right of the Enhance button, everywhere you see it. 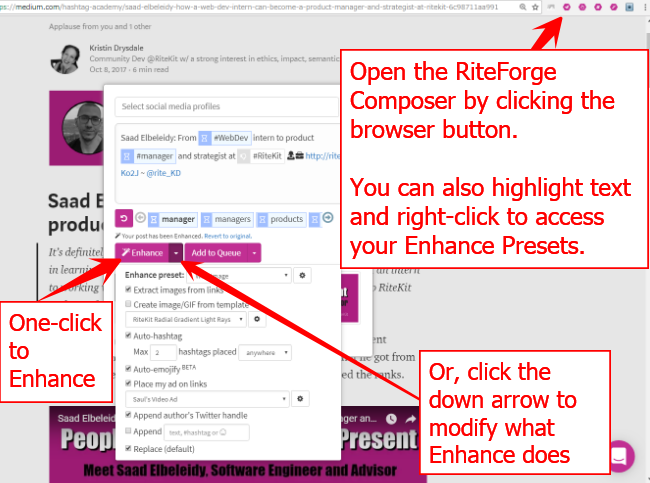 Navigate to your Default Enhance by clicking the RiteKit logo, then the Enhance tab. Select and save what you usually want. When you Enhance in the RiteTag site and browser extension, you can use the down arrow beside Enhance to modify what Enhance does. You can also do this for everything you have in any/all of your Buffer queues with RiteBoost ("Enhance," in the top menu > Bulk Creator, lower left). Here's the tutorial for that. NOTE: With RiteForge, you also get unlimited social profiles, and tiers include the ability to schedule and publish. RiteBoost does not include a social media publisher and thus requires that you either use it with RiteForge, Buffer or Sendible.